This post is meant to accompany the video called “What’s in my Camera Bag?” that I posted to my YouTube Channel. If you want to see that video check it out below. I get asked gear questions more than anything. And, the honest truth is that I don’t really like answering photography gear related questions because I think that gear doesn’t matter all that much. 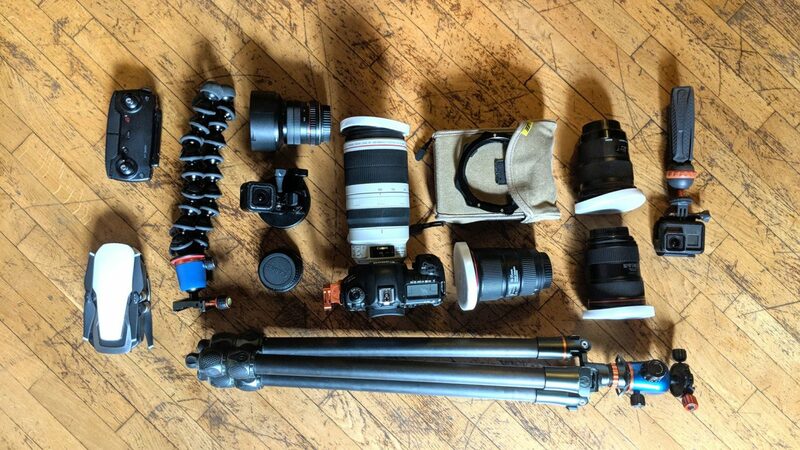 Sure, as you grow as a photographer your gear will need to grow with you. But there is no point in having great photo gear in your camera bag unless you’re getting the most out of it. Still, I wanted to list all the gear in a list form in case you missed some of the pieces in the video. Canon RP with Canon 17-40mm f/4 – This has become my vlogging set-up, and I love it. I can’t see myself changing vlogging set up. Ronin-S Gimbal – My massive stabilization system. Rode Video Micro – Honestly, the best vlog mic solution. Canon EOS R – This has become my main camera body. Canon 5d mark iv – Potentially selling this camera body as I’ve found myself using the Canon EOS R for stills. Rokinon 14mm f/2.8 – I basically use this lens for star photography exclusively. Canon 16-35mm f/4 – My favourite lens. Canon 24-70mm f/2.8 – Standard zoom lens. Typical walk around lens. Canon 35mm f/1.8 RF – For the EOS R. I use this lens mostly for street photography. Canon 40mm STM f/2.8 – A pancake lens. Since getting the EOS R, I don’t think I’ve used this lens once. Sigma 50mm f/1.4 – One of my favourite pieces of glass. Such sharp imagery, and the colour contrast looks incredible. Canon 100-400mm f/4.5-5.6 – I traded in my 70-200mm for this lens. I love the added reach, but do miss f/2.8 from time to time. Mavic Pro 2 – Likely the best travel photography drone out there. GoPro Hero 5 Black – I should probably upgrade this for the GoPro 7, but I don’t use my GoPro nearly as much as I used to. GoPro Hero 5 Sessions – I basically use this GoPro to get dash cam shots while driving. 3 Legged Thing Winston – A bit of a beast for a travel tripod. But, it’s sturdy and packs up really well. Joby Gorilla Pod – The bendy tripod. I use this for vlogging, but also in places where I’m not allowed to use a tripod. 3 Legged Thing Iggy – Mini tripod for my GoPro or phone. 3 Legged Thing L-Bracket and 3 Legged Thing Ellie – The orange L-Bracket on my 5d mark iv. Used to be able to set your camera on your tripod in portrait orientation. Lowepro ProTactic 450 AW ii – I broke my Burton bag and couldn’t replace it where I was. So, I got the Lowepro ProTactic 450AW ii and I really like it. It’s tough, and definitely does the trick. Burton F-Stop Camera Bag – I wish it had a bit more space up top. But, to date, it’s the best camera bag I’ve found. Dell XPS15 Laptop – Fast enough for 4k editing. No drag on photo editing. Lee Filter Lens Caps – the white caps that go over my filter adapter rings. Lee Filter Pouch – the pouch I keep all my filters. All year, I organize different travel photography tours, retreats, workshops and adventures around the world. If you want information on those tours – as they get announced – sign up for the newsletter below. Might be interested in Galapagos islands in 2019. Would that include Machu Pichu? again I congratulate you on your wonderful photos, but I have a question: your recommendation of a Canon 200d Camera Body, for bloggers, is no longer for sale, and I would appreciate it if you advised some new Camera Body for bloggers and that is not too expensive. The best would likely be the Canon m50. In your most recent video talking about the Canon EOS RP, I noticed your quick release plate on your EOS R had a small bipod on the front of it. Who made that? I have issues with the camera tipping over when I set my cameras down with the quick release plate mounted. I’d love to be able to have my camera stand up without tipping over on the lens. Hi John, that’s honestly just the quick release for my Ronin-S. Although I do love it as a grip! I’ve noticed on your youtube video’s that your lenses (even the smaller lenses) seem to have an additional support for them. Can you tell me what that is. That’s just the quick release from my gimbal. I found your review of the Canon 100-200mmL IS II lens so helpful that I recently purchased the lens and I’m very happy with it. During your review, you mentioned that you are still using version 1 of a 70-200mmL IS 2.8 lens. I was given the same lens by an uncle who had just turned 80 and was downsizing all his camera equipment. While I’ve been very happy with the lens which still looks brand new, I’ve been unable to get anyone to comment on just how much better the newer version II or III are. Have you felt any urge to upgrade to a new lens or are you still happy with version I?